특정 자금을 마련하기 위해 기부하는 크라우드소싱은 새로운 것이 아닙니다. 그러나, IoTex는 "스마트 계약" 을 통해 이를 진행하며, 암호화폐의 과열을 자선 기금 활동으로 전환했습니다. 향후 몇 달동안, IoTeX는 "한 블럭 한 블럭씩 세상을 연결시켜감"이라는 미션 이행의 일환으로, 자선 프로그램을 선정해서 커뮤니티 보상 프로그램을 계속해 나갈 예정입니다. IoTeX팀은 커뮤니티와 함께 성장해가며, 한 블럭 한 블럭씩 세상을 연결시켜 나가고자 합니다. 상당히 야심 찬 목표 입니다. 하지만, 훌륭한 팀원들과 지지해 주시는 커뮤니티를 기반으로 이루어 내고자 합니다. 커뮤니티와 함께 블록체인 생태계를 발전을 최전방에서 이끌어 가고자 합니다. IoTeX팀은 우리의 초심과 비전이 커뮤니티에 잘 전해져, 관심과 지원으로 함께 목표에 도달 할 수 있도록 노력하겠습니다. 이더리움은 지난 4년간 블록체인 분야에 일대 혁신을 일으키며 "블록체인"이라는 새로운 용어를 만들어냈습니다. 업계의 선봉에 서서, 이더리움은 전체 블록체인 생태계 구축을 위해 다양한 분야를 이끌고 있는 연구, 개발진들을 북돋기 위해 지원금을 제공해왔습니다. grants IoTeX 팀은 심도 있는 연구와 협업으로 전체 업계를 이끌어 갈 것을 확신합니다. IoTeX 팀은 함께 세상을 깜짝 놀라게 할 유능한 가장 뛰어난 지성인들을 기다립니다. 블록체인 연구를 지원하기 위해 이더리움 재단에 ETH를 기부해 주시면, 작지만 IoTeX 팀에 큰 힘이 됩니다. 자세한 사항은 여기에서 확인하세요. IoTeX 첫번째 자선 프로그램 업데이트. DoraHacks 은 중국에서 가장 큰 해커톤 주최자 이자 해커 개발자 커뮤니티입니다. 2018년에는 한국, 미국, 일본, 영국, 인도 등 10개 국으로 규모를 확장하고 있습니다. 현재까지, DoraHacks은 세계 각지의 7개 도시에서 약 5천여명 이상의 주요 해커들과 20만여명의 전세계 개발자들과 함께 100회 이상의 해커톤을 진행했습니다. DoraHacks은 서로 다른 스킬을 가진 개발자들이 해커톤에서 1천여개가 넘는 앱을 제작할 수 있도록 플랫폼을 제공하고 있습니다. DoraHacks의 해커들은 다양한 블록체인 스타트업을 시작하고 이끌어 가고 있습니다. ProChain이나 이제 막 시작한 CorTex가 그 대표적인 예입니다. 자세한 사항은 여기에서 확인하세요. IoTeX 두번째 자선 프로그램 업데이트. 저희 IoTeX의 공식 텔레그램 그룹에서 참여하실 수 있습니다. 상단에 고정된 메세지를 확인해 주세요. IoTeX를 어떻게 알게 되셨나요? 관심을 가지게 된 이유가 궁금해요. As an influencer who work in this space, I myself believe in the technological revolution that blockchain can bring, just like the internet once did. After seeing many projects throughout the years, Iotex is definitely stand out. The reasons are simple, unlike many projects that just selling dreams through whitepaper and marketing, Iotex seems to get the actual work done, including the prototype, partnership and etc., not to mention the yellow paper is excellently written. Personally, I believe that Iotex solution is more viable than IOTA and Iotex can potentially be a leader in an iot space, which is going to be one of the biggest use case of blockchain (for M2M payment, communication, and data exchange). At first I was looking for a good bounty program. After joining the project as community support I started to learn more about it. I believe in IOTEX innovation. I believe in experienced team with strong academic background. After analyzing the team I beleive that IOTEX may succeed. I'm a blockchain enthusiast with a developer background. 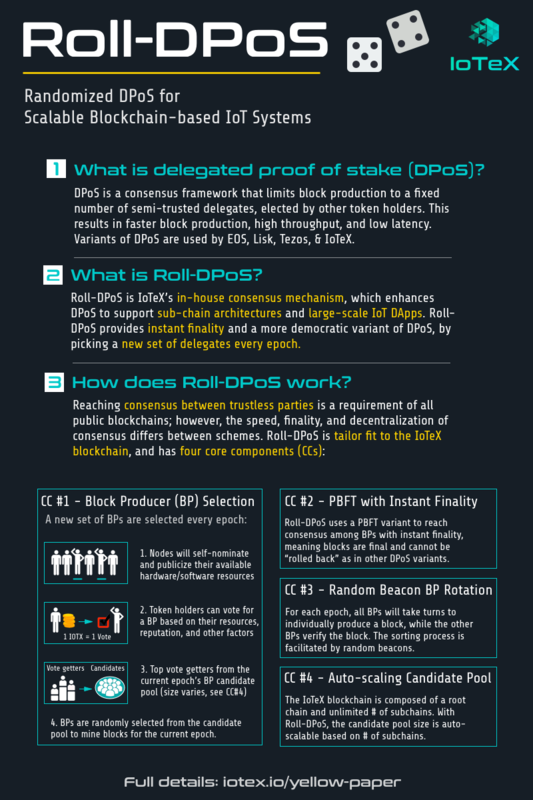 I'm impressed by your vision especially the thinking around the consensus protocol known as R-DPoS. I believe that greater issues of scalability in blockchain networks can only be solved by introducing some sort of a "randomness" in the consensus layer. Following trending telegram channels. Because I believe that the current crypto market hype does not fulfill the ultimate objective (most investors today are currently speculators) and this will eventually fade. Current leading cryptos will be replaced by a handful that fulfill the larger objective of decentralized stable store of value and decentralized utility, like what IoTeX is trying to accomplish. I found IoTex on icodrops and I started researching. I like the project, the team and when I found about this interesting charity idea I had to be in. I think people have to do more to be in good projects, not only to pay. Equality means a lot as well. Learned about it from telegram group and read the white paper and mission and am very pleased and supportive of this project. As a medical practitioner I personally see the benefits of charity and humble giving of our time, talent, and treasure. It’s a privilege to be part of something has revolutionary as IOTEX and still help the world be a better place. I do mass amounts of research into icos and look for the top projects to invest in and I believe iotex is in a great position to be a leader in the crypto currency market and help shape the future of of the the next tech advancement of blockchains. I know IoTeX from a good friend and one of the biggest Blockchain-Enthusiast I know. I myself also really believe in the Future of Blockchain and how it will change everyting to better. I like the efforts IoTeX puts to connect everybody, encouraging all to keep in mind what's the core thing of being connected. Found about about IoTeX through Crypto/blockchain community. Your project has the potential to change the way we interact with technology and will drive further development of technology and change the way we live forever. Unlike many other projects, you are looking at more than “just raising money” and building a solid community around your project. Found about about IoTex through Crypto/blockchain community. Your project has the potential to change the way we interact with technology and will drive further development of technology and change the way we live forever. Unlike many other projects, you are looking at more than "just raising money" and building a solid community around your project. Found them listed on ico drops and after extensive research became sold on the project. The most interesting element of Iotex to me is the fact it's based in the IoT niche which to me is a vital component of of everyday life and will continue to do so to an even greater extent. Coinfreak Chat Telegram Group. The first reason to invest in Iotex is personal desire of acquaintance with innovating high tech technology. During my PhD. in University of Bundeswehr (Munich, Germany) in 2003-2006, under sponsorhip and scholarship by Siemens, I impemented a telecomms equalising and simultaneously decoding algorithm, nationally & worldwide patented by Siemens Corporate Technology AG as "Mentis-Schaffler decoder". It's widely being used today in modern mobile GSM 4G P.P. Standard as well as satellite communication. The main reason for its adoption is achieveness of optimum SNR per bit Signal to Noise ratio, better than GSM's, which was considered absolutely supreme at the time! Thus, I am excited about a new project, which will implement a different architecture & approach in blockchain technology. As an engineer, I find this particularly exciting! The second reason for desiring to invest in Iotex, is willingness to own the best cryptocurrencies in a long term basis. I am a crypto-enthusiast, and I would not forgive myself if at least I did not try to participate in the project. I am founder and owner of a small chain of private schools and publishing companies in Athens, Greece. Our "Mentis" schools, are the first and yet the only ones in Greece that started to accept tuition fees' payment in cryptocurrencies! Bitcoin, Ethereum, Neo, Icx, Eos. If I get selected, our schools would be the first to accept fees and payments in Iotex currency as well! You have now my writing assurance of that. Being owner and manager of these schools, I aspire many of my tech-loving teenager students, as to the benefits of cryptos and especially Blockchain 3.0, that is Iotex. If I get selected, and mainnet runs as planned, I can encourage a lot of my students to accumulate Iotex. I have found IoTeX while searching for interesting new blockchain projects. IoTex seems to be the perfect decentralized solution for the internet of things and it will reshape our future. Being part of the project from the early beginning, is a very humbling experience. A keen futurist, and am part of a university-based blockchain educational community, I was chatting to someone at one of the events 2 months ago about charity and blockchain... they mentioned iotex...a project that combines IoT, blockchain 3.0, and actively supports good causes... definitely caught my attention! I hear about IoTex from my friend, he is IT engineer and know all about IoTeX and other block-chain platforms (also good projects) and he explain to me about IoT and what can do IoTex for Internet Of things in whole world ! And now I understand that IoTeX Incredible-power-privacy block-chain platform ! btw my job is close connected with IoT. Thanks a lot for Your Project and such interesting task's in it ! BlockChainFuture is HERE !!! ;)) i'am tru believer ! I think the way you're raising funds is incredible with your charity initiatives, you're paving the way and setting the example of how companies should manage their investment rounds and place careful consideration on how they help build and support the blockchain ecosystem. Contrats! Telegram. I like Nano. And IoTex tech utilizes a more mature 2-way peg tech that is scalable, cost-efficient and secure. Bonus with the charity program! I think this is a really cool idea! From my best friend. From my childhood age, I loved to learn and discover new things. Crypto currencies is one of them for the last 2 years. The main reason I want to hold Iotex is because I like interconnectivity of devices (IoT). I am a big fan of smart-housing. The second reason is I am pro-western in beliefs. And the third reason is I am very fond of buying goods and services using cryptos as a payment method. I believe Iotex has a significant role to play in future economy! I found it via Icodrops. Because it seems interesting and it starts with a charity donation. Team looks amazing and it is a block chain with great prospects. I know IoTeX from a friend of mine. I have read the white paper and really love the technology and the team behind. I have been following closely for all Iotex movement, including Huobi Talk, Referral/airdrop programme and brain teaser. I heard about the IOT centric blockchain, and my interest was guaged, as the crypto space is in need of this use case. Also, the charity really got me to admire the team and project. I know it from icodrops. I love any new blockchain technology and I really love how iotex is being distributed, by creating awareness about the technology, not just using the typical money grab ico. I heard about IoTex from my best friend who suggested I take on blockchain solutions to develop my high throughput tipping application which can be used by anyone from a street artist to a waitress in a high volume restaurant/cafe. Has been investing in token, the first time to see the white paper of iotex, feel very good, see the video has a deeper understanding of the project, optimistic about the project, willing to focus on investment for a long time. I know via ICO Review. I interested in Iotex after read nice info about it and IoTeX is the next generation IoT-oriented blockchain platform with strong scalability, privacy, isolatability and developability for incubating new IoT applications and ecosystems. Also the Rootchain and Subchain the conjunction of both the chains come the 4 use cases in which IOTEX can be used for is really good for real life. I heard about IoTeX from ICODrops. IoTeX has done a great job creating the next-generation blockchain in the field of IoT! Recommended by an acquaintance. Like many people' idea, I think 'IoT' is the best technology of the future. It is possible to change the world more efficiently & smartly If add blockchain tech, I think it wonderful. From crypto-enthusiasts friends, they told me to look at Iotex project. And I found it very interesting and promising platform, which have all components to be implemented in real world. I learned about you and the telegrams of the groups. I think that Iotex will solve many problems, such as the problem of scalability, lack of privacy, high operating costs and so on. I knew IoTex while surfing the internet looking for good companies that think about the future of technology especially in blockchain, so i can invest in their ICOs. One of the things that hooked me to IoTex that they do charity programs instead of ICOs! This thing show me that they do really care about the future and humanity, rather than business only type of thing! I heard about it from my professor，and I am interested in it because of its profound prospects and dynamic developer group. I found your project in Twitter. IoTeX conquered me with it's excellent idea and I will take part in the Charity program with great pleasure. I've heard about Iotex via twiter and telegram, and I consider it an excelent project. All praise the team! I heard about the project in October or November 2017 from my friends. As a developer, I am interested in Blockchain area and everything new that happens in this area. However I only contribute to projects that I think are game changing and/or are likely to be adopted in the real world. IoTeX is definitely one of these. Found it really early on Icodrops and joined your Telegram in a very early stage. I believe you are on to something and if you manage to follow through all the ideas in the whitepaper you can make a huge impact. Hello! From telegram. You guys doing great project, and your Charity initiative fascinates me so much! I know it by my friend who worked in the blockchain media. loTex attract me because of its powerful and proven foundation technical team and excellent growth prospects. I hear it from my friend who is working in the largest exchange in Taiwan.I think this project is worth to invest and the good team also attract me. IoTeX is going to THE IOT platform of the crypto world. I was looking for an IOT crypto for my portfolio but the current ones did not satisfy my needs. IoTeX does! I am really excited! I like how they are innovating the IOT world by using their own blockchain ecosystem. Even implementing blockchains in blockchains. Iotex will be the beste IOT crypto ever! Friends notified me. I like to invest only in serious cryptocurrencies and really innovative projects! I am very selective. Icodrops. As you are trying to solve speed and scakability issues that current block chains are struggling with. And I also like it for it is decentralized Network for internet of things and road map looks quite exciting. ICO drops. I think the idea of Iotex for IoT, is really great, and as a user of IoT i like it. As a consumer i hope you will succeed in your goals, and make the internet of things to the next level. Because this is the first project that use charity to help this world better, which I think is a good idea. There is a group of crypto enthusiasts and crypto investors, called CryptoBred Team (https://medium.com/cryptobred and https://medium.com/@cryptobred). I signed up for their blogs. I found out that there is such a project - IoTeX. I found the project interesting. If I'm not mistaken, any other projects will be able to use your network in different programming languages, which will be very beneficial for the crypto industry. It is interesting that in reality your project will give peace. I understand this project because my friend introduced I think the idea of this project is very good. I am very optimistic about the future of this team. I paid attention to iotex through my own investigation of the market and voting on the currency，The iotex direction of the Internet of Things is a development trend in the future of the blockchain, and it has a clear direction for development. I hope I can become a supporter of this great team. From my friends.Because it combine the charity with blockchain that I never hear before. I heard about IoTeX from Icodrop and I am interested in IoTeX because it can resolve some of the issue in current blockchain system such as scalability and vulnerability. I want to invest into IoTeX. Icodrops. As a long-term investor and advocate of BC Tech, I want to be part of a revolutionary project aimed at solving the current BC issues and achieving mass adoption. I believe that IoTeX will be a serious contender and could be a game changer. My friends and me are always looking for interesting technologies to support from the very early stage. We really like what IoTeX team is trying to build and would love to make a donation and help it grow. Keep up the great work! Thru research also in icodrops and other sites. I am interested in it's vision and i am becoming more of a fan in this team due to to the goodwill you're trying to show us! Hear from my friends.Because IoTeX have great potential and IoTeX is the next generation IoT-oriented blockchain platform with strong scalability, privacy, isolatability and developability for incubating new IoT applications and ecosystems. I discoverd IoTeX on Icodrops. I find the concept very cool, plus I like the idea of donation very much and I think my project will follow this concept. I heard about your project in Lendex0 and Ian Balina (ICO Reviewer) telegram groups, looks very promising and interesting blockchain. IoTeX has done a great job funding and supportign next-generation blockchain research and pioneers! I am very interested in mathematics, especially your math problem: a/b+b/c+c/a=17. It took me a long time to find the answer，but i failed. I asked the people around me and I didn't finish it. Haha, I'm sorry. But I will pay attention to you as always. Applying the blockchain to the Internet of Things is the most suitable solution to address the lack of traditional IoT architecture. IoTeX is expected to change the future of the Internet of Things. Recommendation from public accounts.IoTeX makes me feel it different from others because it really helps give wonderful future for men. I knew about IoTex from twitter and from diferent ICO rewievs. I believe that thanks to such a project as you , we can improve the blockchain ecosystem. I'm very interested in what makes IoTeX. I believe that this is the best project at the moment, and we really need a crypto community and for our future. I heard from bitcoin Addict, the largest group telegram of Thailand. I think max cap/person will be possible to hype. I have been interested in the IoT tecnology for a long time and I support the majority of projects related to developments in this field. From the media. I am interested in the blockchain tech and the Internet of Things. It’s revolution.It will influence all of us. Through research. I like the idea of using blockchain in blockchains to help overcome scalability issues with IoT. I also believe with the team IoTex has this can go far. Ico drops. Im interested in iotex due to the market it is involved in, IOT. I am a firm believer that IOT and crypto currency are the future and that iotex are the ones to make that future come true.